The Harstrad River is a stream that forms the eastern boundary of the Moesring Mountains. It merges with the Isild River in the Isinfier Plains. The Wind Stone is located on its western shore. If you are looking for evidence of Snow Elves, go to Jolgeirr Barrow located at the very end of the Harstrad River. 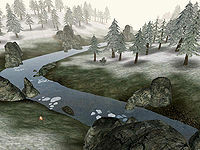 Snow Wolves spawn in a narrow passage through the Moesring Mountains that leads from the Harstrad River toward Hrothmund's Barrow. This page was last modified on 10 July 2013, at 14:48.